Game of Thrones has returned to Iceland for the filming of season 7, to shoot icy-landscaped scenes set in the frozen north of Westeros. As we reported yesterday, several of the show’s crew members arrived in the country this week. We don’t have an exact date yet of when shooting starts, but with the sighting today of one of the show’s biggest stars, it most likely will start very soon. 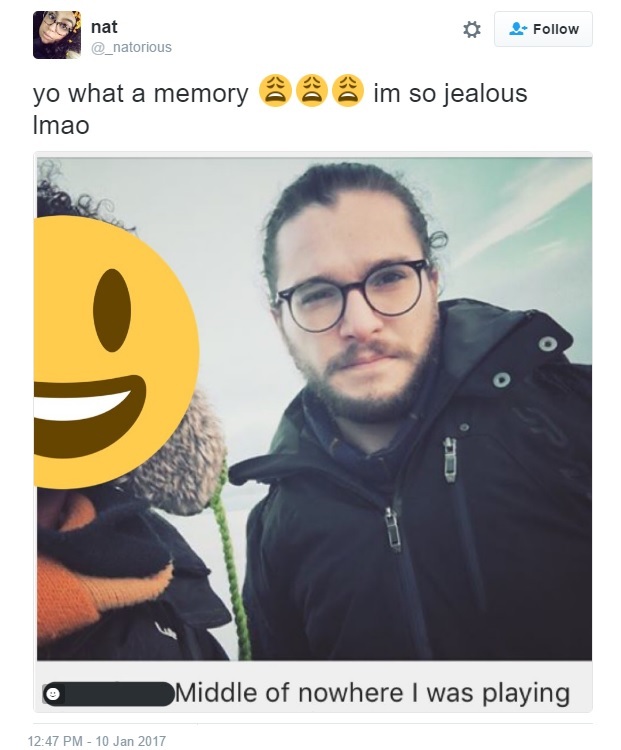 Twitter user _natorious shared this image, after her cousin apparently met Kit Harington (Jon Snow) “in the middle of Iceland.” The specific city or site wasn’t mentioned. We’ll be on the lookout for more cast members in the country! It’s no surprise to see Harington there, though. Major Spoilers beyond this point! Previous spoiler reports have told us that Jon Snow and a few other characters will be journeying beyond the Wall in season 7. Scenes were filmed on an icy set at Wolf Hill Quarry near Belfast, but it’s likely that set was supplementing Iceland’s beautiful and very real vistas for the journey. The sequence will involve action, danger, and a whole lot of wights. Did they really have to wait until January to film this? I guess Kristofer, Iain, Rory and others will arrive. Apart from Emilia because she’s doing her dragons stuff in Belfast and then shooting her Star Wars movie. I swear I’ve seen that cousin before. Face looks very familiar, although the expression changes a lot. ???? Yeah, he just has one of those faces ? Yes they needed Iceland to be this cold, snowy, icy and have shorter days of light. I imagine if it has something to do with WW they may use the long nights in Iceland to give us the true feel of winter that’s coming with force lol besides even though it’s a shorter season they seem to still be doing a lot of filming some that took weeks to do so they would of had to start filming earlier to get it all done and Emilia and Kit were filming other movies up to before GOT filming started and it seems they are filming more movies/miniseries the moment GOT filming ends. They could have filmed this last month. I don’t think a matter of a few weeks here is going to make a mind blowing difference. Jack Bauer 24: They could have filmed this last month. I don’t think a matter of a few weeks here is going to make a mind blowing difference. But is does make a difference, particularly further north. A lot of nighttime scenes are shot during the day and then digitally altered to look as if it is night. Film & TV have been doing that successfully for years: for example, most of the “night” scenes in Lord of the Rings were shot in the daytime, and then altered. Given that “daytime” in Iceland right now is like early evening (the sun crawls up to about 15˚ above the horizon before conking out), it would especially easy to make things look like night. Pigeon: But is does make a difference, particularly further north. The nights were only a little longer a month ago than they are now. We now are almost three weeks past the solstice: i.e., back to where we were at the very beginning of December. Of course, that means that they are up to ~5 hours of sunlight a day, and it’s like early evening at (solar) noon. It is another few weeks before the increase in daylight per day really picks up. The big difference is that they seem to get more “wintry” weather in January & February: it’s colder in January than it is in December and there often is snowfall. Keep in mind that Iceland is not as cold as people think it is: the Gulf Stream loops around the island, which cuts down on the cold water coming in from the pole. (That might stop because of climate change: the increased cold-water flow from the North Pole -> Gulf Stream might basically cause the Gulf Stream to re-route south: so, ironic though it might seem, warming might cause Iceland and the British Isles to get a lot colder!) So, it takes time for the effects of the prolonged darkness (and seasonal change on the ocean temperatures) to kick-in up there. And, of course, they were not going to be starting major filming a month ago with the holidays on the horizon! Indeed. In the film world it’s called day for night. Filters were used in the pre-CG days. In fact, in 1973 Francois Truffaut made a terrific film about the making of a film which was entitled Day For Night in English-speaking markets, and originally titled La nuit américaine, or American night, which is the French term for the process. The big difference is that they seem to get more “wintry” weather in January & February: it’s colder in January than it is in December and there often is snowfall.Keep in mind that Iceland is not as cold as people think it is: the Gulf Stream loops around the island, which cuts down on the cold water coming in from the pole. (That might stop because of climate change: the increased cold-water flow from the North Pole -> Gulf Stream might basically cause the Gulf Stream to re-route south: so, ironic though it might seem, warming might cause Iceland and the British Isles to get a lot colder! )So, it takes time for the effects of the prolonged darkness (and seasonal change on the ocean temperatures) to kick-in up there. Yes I know….which is why, as I said, it does make a difference. Pigeon: Yes I know….which is why, as I said, it does make a difference. Ah, I thought it was reference to how much night there was! The two have gotten confounded, it seems. They haven’t been waiting. They’ve been shooting non-stop since 31 august. Alan Taylor, who directs the Iceland scenes, was shooting at the quarry until Xmas! I don’t know why my comment is disappearing when I try to add a link. It looks like Iain Glen might be in Iceland as well. In other news, GM is still not close to finishing Winds, per a comment on his NaB post “Doom, Despair,Defeat”. Thanks to “Eagle Eye” Cumsprite for the heads up. GM cant even find the time to make an official post updating his fans. So Jon is going to be in Dorne and beyond the wall in all of 7 episodes?!? Alfie Allen left Belfast today. I wonder if he filmed his own stuff aka Greyjoy or if he filmed some scenes with Emilia since she’s been in Belfast too. I’ve always had a softspot for Alfie, his so incredible as Theon. He may not be a fan favorite for everyone but no one can doubt Alfie’s acting ability. Nobody ever seems to know where Emilia is, no one has seen her arrive or leave Belfast, we only know she’s been in Belfast because she told us on her IG, she’s a bloody ninja people only see her when she wants to be seen. We should by now get used to the fact that “large” time jumps will be made between and even in episodes next season. It’s not that shocking. In season 1, Tyrion travelled from WF to the Wall, to the inn and then to the Eyrie in a mere 4 episodes. Probably shooting her scenes in Belfast. No, as Mel wrote. We don’t have any information suggesting he’ll go anywhere near Dorne. We have location filming confirmation he’ll at least be at Winterfell, Crownlands areas, beyond the wall and assume Eastwatch-by-the-Sea. ep. 7 King’s Landing, Dragonstone?, traveling? Yeah love Alfie. He has always been among the 3 best performers on the show. He’s the perfect Theon. I think Emilia manages to go unnoticed because she looks so different from Dany without the silver hair. Mel: I wonder if he filmed his own stuff aka Greyjoy or if he filmed some scenes with Emilia since she’s been in Belfast too. Probably with Pilou, over the past couple of days. Pilou was seen in Healthrow today, arriving from Belfast. “Not done yet, but I’ve made progress. But not as much as I hoped a year ago, when I thought to be done by now. Like he says though- it’s no guarantee of anything ? No now it ends ! When Jonathan Pryce’s character flicks the envelope at Tom Hardy’s character, I couldn’t help but say to a room full of people, “The High Sparrow clearly didn’t learn his lesson”. I was really disappointed the show was over, and I didn’t have another episode to watch. I watched Lucy on the station before Taboo, which of course Pilou is in at the beginning. Funny how the cast just seems to pop up everywhere now. Anyway, yeah, Pryce’s character (Sir Strange) acts like it always felt the High Sparrow wanted to, or did inside. There’s some real aggression building in that dude. I had a hard time with all the commercials. I watch so much premium cable and streaming svc programs these days that an hour and a half program with commercials is maddening. Wimsey: Ah, I thought it was reference to how much night there was!The two have gotten confounded, it seems. Even growing up in northern Canada (which truly wasn’t even all that far ‘north’ – just the ‘inhabited’ kinda north), it was amazing how quickly weather changed in these months. Add in the fact that it was bordering another province which doesn’t ‘do’ daylight savings time, and it just emphasized it! I had a difficult time with the commercials as well- next time I’m going to wait to watch until the episode is over, so I can ff through them. It was a bit out of hand. Just saw him in Reykjavik yesterday, 1/21. Walking through the main strips, talking on the phone. Lots of people gawking.